Tall Husband says that building a structure is like making sausage: The sausage may turn out to be delicious but you don't want to watch it being made. Above is proof: we learned that our 1920 bungalow has it's original underground plumbing...which has to be brought up to code. Codes or not, the old pipes aren't functional. 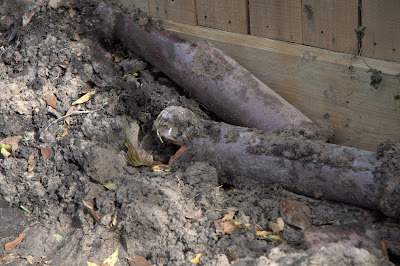 The pipes which are visible were updated, so we did not suspect that they connected to antique pipes underground. Surprise! We cannot wait until the next surprise. But there is good news to report: we have a great team of architects, builder and plumbers. You are right about that. No fun! But just think how nice everything will work once it's replaced. OH NO! What a mess and what a disappointment! However, if you have a great team to correct the problems...you are ahead of the game! Really! You sound calm, confident, and collected. I live in a house that I love where a new crack appears often. I hope your troubles are quickly fixed! Go team!